1) This paper is a Malaysian Peer Review paper, which will be presented at FIG Congress 2014 16-21 June, in Kuala Lumpur, Malaysia. We are pleased to share this Peer Review paper with you already now prior the congress to highlight one of the topics - real estate - covered at the congress. On the 19 and 20 June the Board of Valuers, Appraisers and Estate Agents Malaysia has been invited to participate in the Congress. and together with FIG Commission 9 and 10 special sessions on valuation and estate management are being prepared i.e. the launch of the International Property Measurement Standards (IPMS). Mr. See Lian ONG, Chair Elect of FIG Commission 10, is furthermore facilitating a high-level session on Building Information Management, BIM. The supply and demand condition of the property market and the attractiveness of the property portfolios are among the key factors that investors evaluate before deciding to invest in the initial public offerings of real estate investment trusts (REITs). To meet this information need for decision-making, a real estate market study report is often provided within the prospectus for the purpose of initial public offering (IPO) and listing on the stock exchange. This paper examines whether these reports meet the property market information requirements of REIT investors by examining retail market study reports found in the REIT IPO prospectuses of Bursa Malaysia for the 2005 to 2013 period. The analysis of the retail market study reports are based on criteria derived from literature review on the criticisms of real estate market studies. Content analysis using the criteria is applied to examine whether there are weaknesses in the retail market studies. The analysis found that the general headings and contents of these retail market studies are generally the same. However a detailed content analysis reveals that there are weaknesses in the areas of data analysis and analytical techniques of these retail market studies. Hence the generally broad headings (i.e. form) found in the content of a market study may not necessarily provide enough information/data (i.e. substance) to assist investors in making their investment decisions. Each REIT initial public offering (IPO) requires a prospectus to be filed with the Securities Commission and the Stock Exchange. The prospectus provides details about the REIT investment offering for sale to the public. A prospectus will contain the facts that an investor needs to make an informed investment decision. Apart from the information on the offeror, the properties, the managers, the trustees, the trust deed etc other important information such as valuation certificates, proforma balance sheet, profit forecast and taxation are provided in the appendix of the prospectus. The supply and demand condition of the property market and the attractiveness of the property portfolios are among the key factors that investors evaluate before deciding to invest in the initial public offerings of real estate investment trusts (REITs). A real estate market study report is often provided within the prospectus for the purpose of initial public offering (IPO) and listing on the stock exchange to meet this information need. This real estate market study report is a new form of market study that fulfills the needs of investors and is different from the traditional market studies that are conducted on new property development. This paper will examine whether these reports/studies meet the investment requirements of the REIT investors. The market study attempts to identify and select the best site for the identified use for maximum profit and growth. The study attempts to determine the most fitting and probable use by studying and comparing legal, physical, market and financial aspects of alternative uses. The study determines the market and financial feasibility of the proposed project. Capital in search of investment (use known, site unknown). A real estate market study analyses the general market demand for a single or multiple types of properties at a particular location. Generally real estate market studies are conducted as part of the development appraisal process (Miles et. al, 2007). However real estate market studies for the REIT IPOs of the capital market are for investment appraisal purposes. In the context of market study for the capital market, a market study is concerned with the determinants of investment profitability and its sustainability e.g. population, households, employment and income etc. Market study is the identification and study of the market for a particular development/investment. The market study specifically relates market conditions to the property under evaluation. It must show how the interaction of supply and demand affects the feasibility or attractiveness of the development/investment. The study is used to determine whether there is market support for an existing property or properties in a portfolio in the foreseeable future (Geltner et, al, 2013). An existing retail centre is deemed enjoying maximum productivity only after an appropriate level of market support has been demonstrated to exist for that use. In-depth market studies go much further in specifying the character of that support. Such studies may determine key positioning strategies, provide estimates on the market share and absorption rate etc. (Fanning, 2005). The techniques and procedures of market studies are getting sophisticated. Market studies can be developed into elaborate analyses. 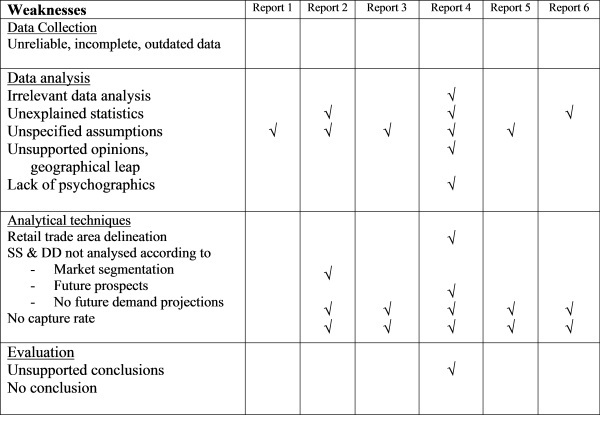 Fanning (2005) suggests various levels of market analysis that reflect a spectrum of procedure, methods and techniques. Myers and Beck (1994) has proposed a ‘four-square design’ approach to take into account of the present-future and macro-micro dimensions to conduct a comprehensive market study. A good market study should take into account of present and future market conditions and also the macro and micro aspects of the property market. To conclude on market trend and prospect. Real estate professional bodies often provide guidance to its professional members in carrying out various professional tasks which covers valuation, ethics and market studies. In US, a position paper on market analysis in the appraisal process was adopted by the Joint Valuation/Research Subcommittees of the National Council of Real Estate Investment Fiduciaries (NCREIF) in 1995. This was released in an article by Wincott and Mueller (1995) in The Appraisal Journal. An update of the position paper was released by NCREIF Valuation Committee on 21 May 2012 (NCREIF, 2012). In Malaysia, upon the aftermath of the Asian Financial Crisis, the Bank Negara has recommended to provide property market studies to support lending to the property sector. A guideline known as “Market and Feasibility Study Guidelines for Property Projects or Property Investments” is prepared by The Association of Valuers and Property Consultants in Private Practice Malaysia (PEPS) in 2001. The guidelines are prepared in response to the National Economic Recovery Plan report of August 1998 that bank lending should be based on merits of the case and supported by detailed market and feasibility studies. However the PEPS guidelines to market study cover merely two pages and all within eleven bullet points. The guidelines did not provide sufficient details on the content, components and scope of a good market study. Despite the lack of details in the guidelines, property consultants had nevertheless continued to prepare market study reports over the years. The market study reports found in REIT IPO prospectuses of Bursa Malaysia provide a research opportunity to examine the adequacies of these market studies, which are publicly available, in providing the necessary information for potential REIT investors in their investment decision making. A literature review is carried out to find out the weaknesses of real estate market studies. 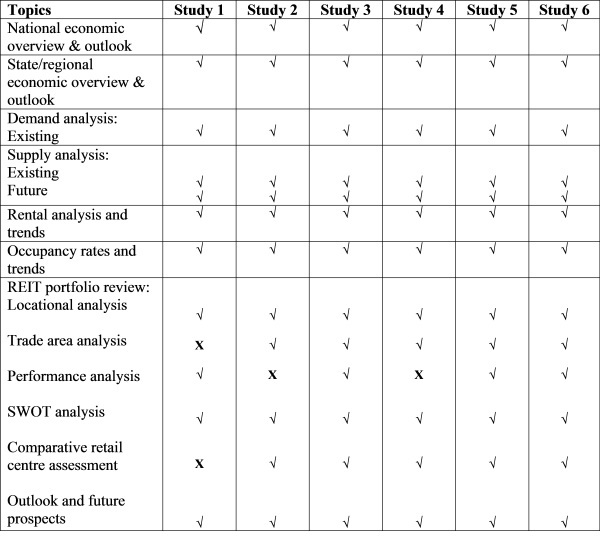 Ting (2007) has summarized the criticisms of market studies under four major stages in carrying out a market study i.e. data collection, data analysis, analytical techniques and evaluation. These four major stages are adopted to facilitate a systematic analysis of the content of a real estate market study report. The technique of content analysis is applied to examine the contents of market study report found in the REIT IPO prospectuses for the 2005 to 2013 period. As the retail market is a more complex property sector that requires detailed analysis, only the market study reports that covered the retail market are analysed for this research. To aid content analysis, words, sentences, paragraphs, tables and figures relating to retail market prospects are used to examine the adequacy of the retail market studies whether they satisfy the objectives of these reports. To examine the ‘form’ aspect of the retail market studies, major topics/headings of these reports are collected and to be evaluated against the market study reports. To examine the ‘substance’ of these studies, the strengths and weaknesses of these studies are evaluated against the list of criticisms by Ting (2007). Out of the 15 prospectuses issued during the study period, only six contain retail market study reports (refer Table 1). Note: 1 – The figures in bracket represent the number of pages dedicated on retail property market and retail centre analyses. For analysis, the respective market study reports are coded and arranged randomly to avoid possible identification of the property consultancy firms that prepare the reports. Table 2 shows the results of the analysis. The market studies concerned did not provide any form of coverage in these areas. A retail market study that concludes that there is good prospect in investing in the REITs should contain analyses and evaluations that are supported by facts and figures. Table 3 examine and evaluate whether there are any weaknesses in the retail market studies. Table 3 shows there are distinctive weaknesses in the retail market studies at two levels i.e. individual studies and common weaknesses among studies. At individual report level, two of the reports have significant weaknesses and the balance four are well prepared. The common weaknesses among the market studies are (a) unspecified assumptions (b) lack of future demand projections; and (c) no capture rate. The existing demand factors are assumed to extend into the future. Facts and figures on existing and future supply are usually provided. Existing supply and demand situations are often analysed using occupancy rate. However there are no projections provided for future demand. With the lack of analysis between future supply and demand, the conclusion made on the future prospects of the shopping centres in the report is questionable. The capture rate of each shopping centre is not specified in the studies. It is assumed to remain constant and is not affected by new shopping centres coming into operations and within the trade area. This omission may seriously affect the reliability of the conclusions of the reports. The supply and demand condition of the property market and the attractiveness of the property portfolios are among the key factors that investors evaluate before deciding to invest in the initial public offerings of real estate investment trusts (REITs). To meet this information need, a real estate market study report is often provided within the REIT prospectus for the purpose of initial public offering (IPO) and listing on the stock exchange. Content analysis using the criteria is applied to examine whether there are weaknesses in the retail market studies. The analysis found that the general headings and contents of these retail market studies are generally the same. However a detailed content analysis reveals that there are weaknesses in the areas of data analysis and analytical techniques of these retail market studies. In conclusion, the retail market studies found in REIT IPO prospectuses need to be read in detailed to ensure the conclusions made are well founded and based on proper analysis of facts and figures. Before making any investment decisions, a critical reading of the reports particularly the implicit assumptions made will help investors to conclude whether there is any sustainable prospect in the shopping centres owned by the REITs. Brett, D. L. and Schmitz, A. 2009. Real estate market analysis: methods and case studies. 2ed. Urban Land Institute, Washington, D. C.
Professor Sr Dr. Kien Hwa TING, Ph.D.(Finance), FRICS, FRISM is Head of Centre for Real Estate Research (COREResearch), Universiti Teknologi MARA, Malaysia. Prof. Dr. Ting is an Academic Member of Asia Public Real Estate Association (APREA), a Board member of the Pacific Rim Real Estate Society, RICS Malaysia Board member, Council member of the Royal Institution of Surveyors Malaysia and a member of the NAPREC Expert Panel (INSPEN). In August 2013, Prof. Dr. Ting has been appointed a member of the Standards Setting Committee to develop a global standard known as International Property Measurement Standards (IPMS) for measuring buildings. Prof. Dr Ting is currently the Editor of The Malaysian Surveyor and International Surveying Research Journal of Royal Institution of Surveyors Malaysia. He is also an Editorial Board member of Pacific Rim Property Research Journal, Journal of Real Estate Literature and Journal of Corporate Real Estate.